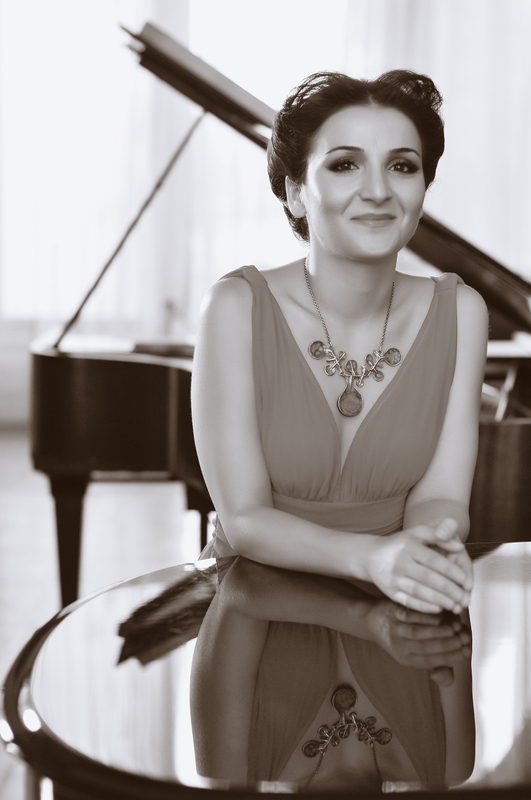 Dr. Tatev Amiryan is a classical composer and pianist. She has performed extensively in Eastern Europe and in different parts of the United States, both her own music and pieces from classical and contemporary repertoire, and piano improvisations. Her music has been performed in the United States, Armenia, Russia, Israel, England, Poland, Germany, Netherlands, Belgium, and Japan by such renowned ensembles and performers as German Chamber Philharmonic of Bremen(Germany), Carpe Diem String Quartet(USA), Ensemble Oktoplus(Germany), Metropolitan Choral of Kansas City(USA), pianists Jeffrey Jacob(USA), Artur Avanesov(Armenia), Hayk Melikyan(Armenia), and thereminist Thorwald Jørgensen(Netherlands). Tatev Amiryan has received such awards as the 1st prize at the Armenian Allied Arts 71st Annual Composition Competition, the UMKC Conservatory Chamber Music Composition Competition, and the Metropolitan Chorale of Kansas City’s Chorale Composition Contest. In 2013 she was commissioned a piece by North German Radio NDR Norddeutscher Rundfunk which was premiered by Ensemble Octoplus in Hannover, Germany in 2014. In 2016 Dr. Amiryan was awarded the 2nd Prize at New Ariel Recordings Fifth International Piano Composition Competition and her piece “Tristesse” was chosen to be recorded by American pianist Jeffrey Jacob and was included in his American piano music album released in 2016. In April 2016, she released her first album of piano compositions performed by Armenian pianist Hayk Melikyan. Tatev Amiryan has presented lectures and lecture-recitals at a number of international conferences and festivals in the United States and in Europe, including Women in the Arts International Conference at University of Missouri-St. Louis, Women Composers Festival of Hartford at Hartt School of Music in Connecticut, London International Piano Symposium at the Royal College of Music, the 12th Annual Hawaii International Conference on Arts and Humanities in Honolulu, Hawaii, USF New Music International Festival at the University of South Florida and the 3rd Hildegard Festival of Women in The Arts at California State University in Stanislaus. She has also presented lectures and lecture-recitals as a guest composer at Florida State University in Tallahassee and at the University of Connecticut, UConn, and as an artist in residence at Southern Connecticut State University. Tatev Amiryan holds bachelor’s and a master’s degrees in composition and musicology with minor in piano from Komitas State Conservatory of Yerevan, Armenia and DMA Doctor of Musical Arts degree in composition from the University of Missouri-Kansas City Conservatory of Music and Dance. She has taught at a number of higher institutions in different parts of the United States, including University of Missouri, UMKC Community Music and Dance Academy, SAE Institute San Jose, Cogswell Polytechnical College, and Crowden Music School in Berkeley. Currently she serves as a part-time lecturer at San José State University School of Music & Dance.